For guided museum tours through the Beethoven-Haus in Bonn (Germany) the Synexis tour guide system is used. Guided tours in the Beethoven-Haus in Bonn (Germany) are acoustically enhanced by using the beyerdynamic Synexis tour guide system. The birthplace of Ludwig van Beethoven in Bonn is an attraction for people from all over the world. The museum houses the world’s largest Beethoven collection. Beethoven’s life and work is clearly demonstrated by impressive authentic documents. The permanent exhibition in twelve rooms with more than 150 displayed items gives a thorough insight into the life and work of this great composer. In addition to this, changing exhibitions with exciting subjects deal with Beethoven and his historical environment. The personal experience you get with a guided tour cannot be replaced by anything else, because you get first-hand information and questions can be answered individually. It is an important part of public relations and museum education. As contents are to be transmitted, it is essential that the visitors acoustically hear everything for a better understanding. The Beethoven-Haus regularly offers guided tours for groups of visitors in German and other languages. These guided tours are acoustically enhanced with the beyerdynamic Synexis tour guide system without disturbing other guests. Inside and outside the building the visitor groups can hear the tour guide better – Beethoven is simply a subject of listening. In the Beethoven-Haus the tour guides use two handheld microphones so that two guided tours can take place simultaneously. For hands-free explanations or when the hands have to be free for documents, the tour guides can use a holding sling for the microphone. For the visitors there are 50 receivers with single-ear headphones available. The single-ear headphones are easy to clean, which is important for hygiene. The whole system is accommodated in the charging and storage cabinet to be always ready for visitor groups. The transmitter and receivers equipped with standard rechargeable batteries are quickly recharged and the charging unit recognises automatically when the devices are fully charged to avoid overcharging. The intelligent charging technology also prevents a wrong operation by switching devices automatically off when they are inserted and by recognising devices with alkaline batteries when they are accidentally inserted into the charger. For the Synexis system there are induction neck loops available which can be used instead of headphones when wearing hearing aids or cochlea implants. 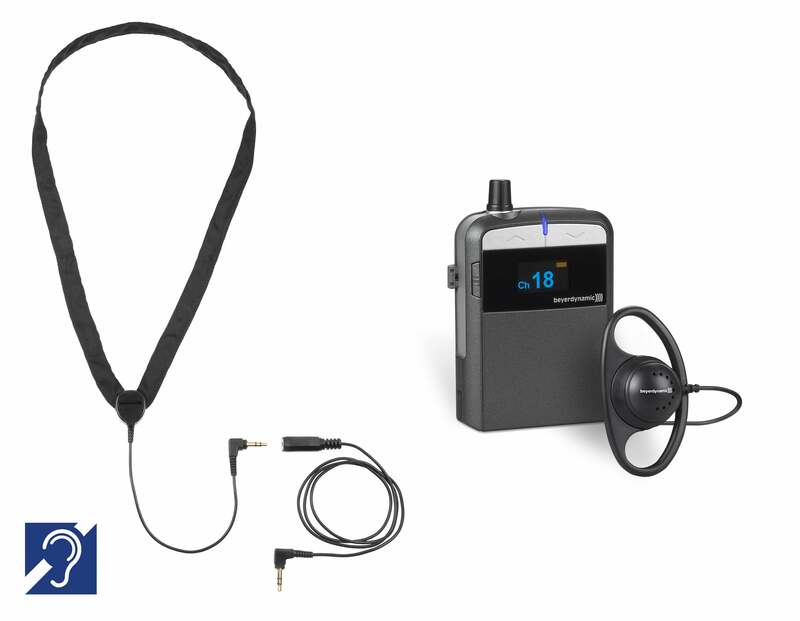 With these items the audio is directly transmitted to the hearing aid/CI and the guided tour becomes accessible for deaf people.